Vattenfall has decided to participate in the offshore wind tender in the Dutch part of the North Sea, the first non-subsidized tender in the world. This is a major milestone for Vattenfall and would be an important step to become fossil free within one generation. Vattenfall is firmly committed to the green transition of Northern Europe, investing more than EUR 2 billion in renewable energy between 2017-2018. Therefore, Vattenfall has decided to join the offshore tender ‘Hollandse Kust Zuid’ and sees the project as a significant milestone for both the green transition of the Netherlands and Vattenfall. “As an energy company with a strong presence in the Dutch market and with a firm view on the developments in the Dutch power market, we are very committed to take a leading role in the green transformation of the Dutch economy. Hollandse Kust Zuid would be an important milestone,” says Magnus Hall, CEO, Vattenfall. Vattenfall has considerable experience in offshore wind along the entire value chain: from development and installation to selling wind power to households and businesses. In The Netherlands one example is Vattenfall’s recent agreement to supply renewable electricity from its wind farm Wieringermeer to Microsoft. Vattenfall’s offshore unit is recognized as one of the leading players globally with a strong track record in reducing costs in offshore projects. The portfolio is stable and consists of 21 North European offshore wind farms in operation and under development. 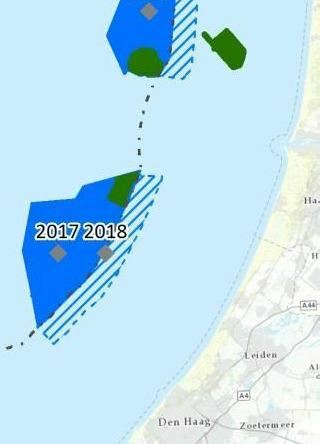 The North Sea and in particular the ‘Hollandse Kust Zuid’ site has good wind conditions and there are significant synergies to Vattenfall’s nearby offshore windfarm Egmond aan Zee. In addition, the Dutch tender, which has to be realized in 2022, fits well with Vattenfall’s North Sea wind farm pipeline and can therefore easily be incorporated in the current procurement and execution strategy. “We have been very thorough in making sure our business case is strong and we are well equipped to manage all risks. We combine a strong track record in building and operating windfarms at the lowest cost with an ability to handle market risk and sell electricity on the Dutch market. We believe that our proposal represents a very solid all-round proposition to meet the Dutch government's needs. The country’s strong commitment to renewable energy creates a stable regulatory framework. Along with support in terms of providing the substation and grid connection these are very important parts of Vattenfall’s decision to bid. ” says Gunnar Groebler, Head of Vattenfalls Business Area Wind. In 2016 Vattenfall won the Danish offshore projects Vesterhav Syd & Nord and Kriegers Flak at record low bids. The construction of these projects, which are to be commissioned no later than 2020 and 2022 respectively, are under way and recently culminated with a large order for the turbines with Siemens Gamesa further underlining Vattenfall’s ability to reduce costs. “Through close cooperation with our suppliers Vattenfall has made tremendous progress in bringing down costs of offshore wind over the last few years. We will continue to bring costs even further down, which gives us the confidence that we can build and run this windfarm profitably even without subsidies. Of course this would be a major milestone for us,” says Gunnar Groebler. 356 km2 in total, located 22,2 km (16 km– 35km) off the west coast of the Netherlands, each (total of two) site large enough to install between 342 –380MW, corridors in-between sites due to cables/pipelines and safety zones. The water depth : 17 – 28 m.
Seabed condition: Sand waves +- 3 m height length 500 m. first 20 – 25 m is mainly sand, local thin clay layers up to 3m.